I have been working on getting approx. 1500+ points in some at least minimum "table top gaming condition" before Mid-june. 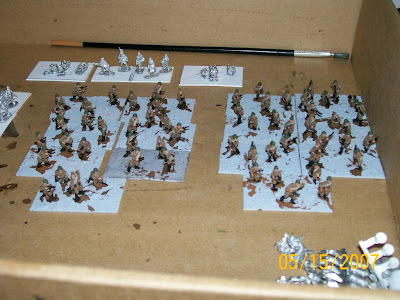 I have most of the fig.s together, and near 1/2 painted. here are sme recent photos of the progress. Here are a few photos from work done last week. 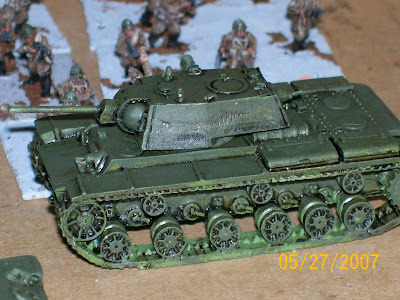 I have been working mostly on modelling this week, and now have completed a mortar company to go with my Tankovy Batalion. Also, 11 T-34 and 3 stuarts await priming and 3 stuarts wait to be green. 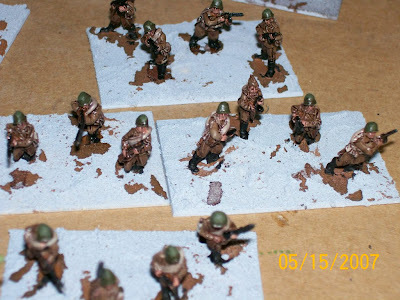 2 platoons of inf are finished and several platoons of tanks are green and ink washed. I will take some more pictures and get an Up-to-date update posted tomorrow. 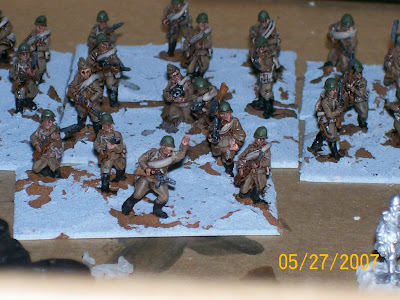 The first two pics are of infantry with highlights (stage 4)- awaiting final higlight and base finishing to get them to "table-top std". The next pic is the KV with the W & N peat brown.magic wash and a drybrush of GW catacian green over the design masters "basil" spray paint. I am not too impressed with the outcome. I will keep experimenting to get a satisfactory highlight color, bur right now my focus is to get 'em all green before June 15.
inf at stage 1, all base colors Stage 2, with peat brown ink and magic wash.
a comparison of washes- the top KV is a dark brown GW ink/water wash vs. the bottom with W&N peat brown ink and Magic wash. really no comparison....the magic wash rules. I am working to get at least 1500-2000 pts painted into a "table-top-gaming std" paint level before mid june. 7 T34, 1 inf. 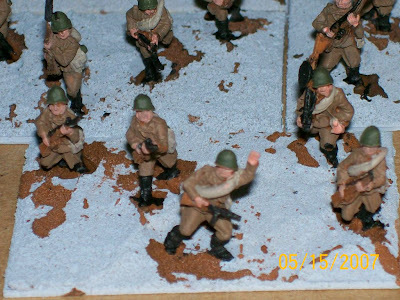 coy, 6 stuarts, 3 su 122, 3 ba-10, 3 kv1, are assembled and in some stage of painting. I have begun to do some painting. 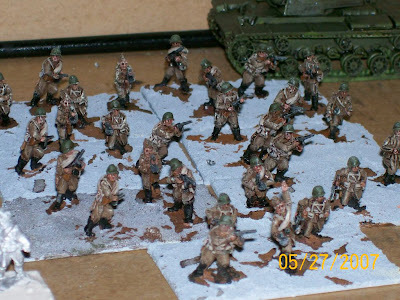 I have an infantry company(tank riders for the tankovy batalion) based, and now under coated. 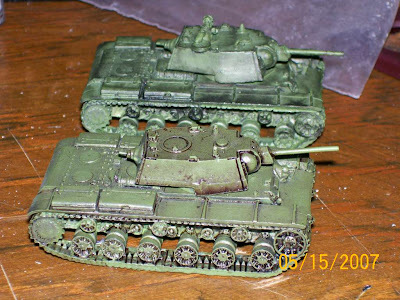 the kvs and su122s have been undercoated and spray painted with a "Basil" colored spray paint. I tried washing the tanks with black, I am not sure I like the look, I may try a brown wash next. 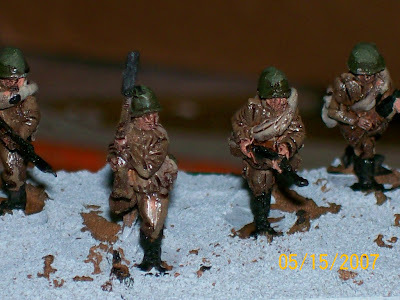 the infantry wearing their base coat. Im trying a modified "six minute" painting method; basically basecoat, topcoat detail, wash, highlight... stage one complete. I have few complaints about the Old Glory vehicle models. 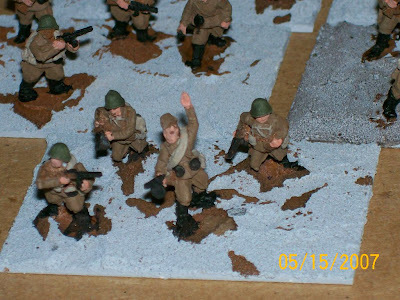 the 15mm models have good detail, and they assembled quickly and with little problem. There were really no major issues with the castings, just a few mold lines and some extra flash. One complaint I do have is that the barrels supplied for the KV tanks were the same size as the stuart barrels, and smaller than the BA-10 barrels. They were too short as well so I decided the "stock" barrels had to go. I made my own out of some wire and I think they look pretty good. I am awaiting the arrival of the tank commanders before deciding which and how many of the tanks will be buttoned/unbuttoned.